When the 4wd suddenly stopped working on my 2000 F150 I had to troubleshoot an unfamiliar problem. I reached for my Haynes manual, but it was You Tubers that gave me the best directions. The system described here, manual shift on the fly, involves a vacuum diaphragm, vacuum lines and solenoids, a reservoir and the 4wd light switch. Firstly, I resolved a loss of vacuum. 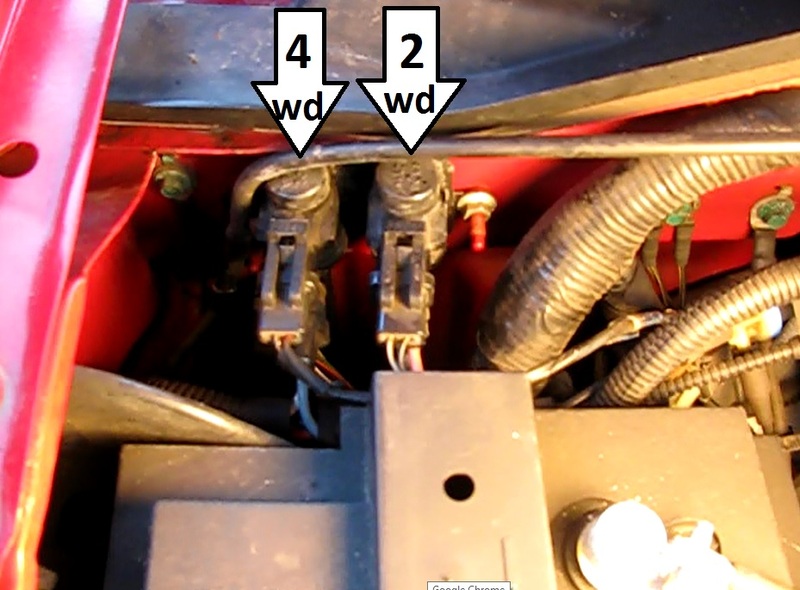 Then I replaced the 4wd light switch to return the system to consistent operation. I cover this in another post. The first notice that there was a problem was the failure of the 4wd light on the dash to come on after shifting. But I was troubled by the question "was it really not working?" So I jacked up all four wheels and put it in 4 wheel. The front wheels did not turn in 4wd. 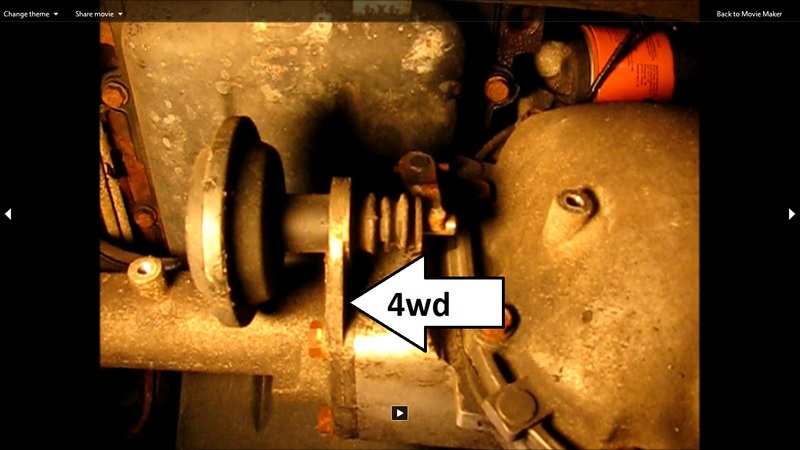 Another way to check operation is to have a look at the vacuum actuator under the front of tbe truck. 1) Jack up the front of the truck and set on stands. 2) Remove the cover from the actuator. Three 10mm bolts. 3) Start the truck and leave in park. Note the relative position of the actuator. It will be to the right. 4) Place the truck in 4wd. The actuator should move to the left. Mine did not move. Since vacuum plays such is such a big part in the show, I took a look early in troubleshooting. I opened up a line feeding one of the solenoids. Only the front of the truck needs to be up. 1) Unplug the electrical connectors from the two solenoids. Push down and wiggle loose. 2) Pull the vacuum lines out of the solenoids. The lower of the two is the supply. 3) Start the truck and check for vacuum. It should always be there, in four wheel or not. With the truck running, it wasn't there. Now we have to backtrack to find where the vacuum is and is not. We are going to look for, and inspect, the vacuum reservoir box. 4) Disconnect and remove the battery. 5) Unbolt and remove the battery box. (four 15mm bolts). 6) Separate a wiring harness from the box with a prying tool. 7) The smaller of the two reservoirs is for 4wd. Remove the supply line from it and check for vacuum here. It was present. I thoroughly inspected this box and could find no crack. I put some low pressure compressed air into it and looked for air bubbles with a dish soap and water mixture. Once, I think I may have seen a bubble. It was that indefinite. I applied silicone to all the all the seams on the box as a simple remedy..
Hook the battery back up, without mounting, and test again for vacuum. It was now there at the inputs to the solenoid. 1) Mount the battery box. 2) Snap the reservoirs back together and into mounting position. 3) Mount and connect the battery. 4) Plug the vacuum lines back into the solenoids. 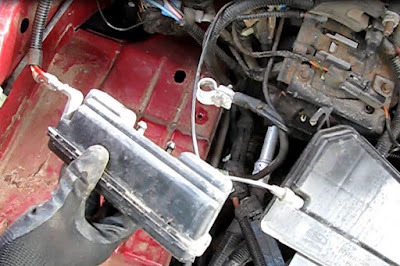 5) Plug the electrical connectors into the solenoids.